I’d like to start this post with a small request: Hit Win+D for me. I’ll wait here. Go ahead, do it. Okay, done? What did you see? Was it a hot mess of cluttered icons for every application that felt like throwing its icon on the desktop when you installed it? Or perhaps you’ve given up on desktop icons altogether, opting to just hide them all so your wallpaper shows through in its full glory? Whatever the case may be, there’s a simple and free utility called Fences that transforms the Windows desktop from cluttered to neat, with very little effort. 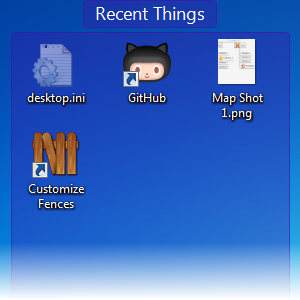 In a nutshell, Fences sorts your desktop icons into separate areas which you can independently move and collapse. It’s one of those essential tools that should have really been a Windows feature, and indeed, some PC makers bundle it with their pre-installed copy of Windows when they sell you a new computer. After you click the blue Download button, the site will ask for your email and then send you a download link. If you don’t feel like giving out your real email address, MakeUseOf has covered a whole bunch of disposable email services over the years, so feel free to use one of these instead of your real address (although Stardock is a reputable company and they’ve never spammed me). The Download button takes you to Download.com, where you can see over 4 million people have already downloaded Fences, so this product must be doing something right (other than the annoying download process). Once you have the installer, getting it set up is just the normal Next-Next-Next routine, so click away until you’re done. All I can say is, “wow.” That’s a pretty dramatic difference, in just one click. You can see Fences created a bunch of new Fences based on the icons I had – QuickLinks, Recent Things, Programs, Web Links (of which I had none), Folders, and Files & Documents. Not all of these are useful for me, but it’s definitely a strong starting point, and shows what Fences can do. After clicking Remove Fence, Fences asked for confirmation and then quickly got rid of that useless fence. Even with your icons all neat and tidy, you may not want them showing all the time. Fences adds a great little trick for this: Just double-click anywhere on your desktop, and all of your icons instantly vanish. Double-click again, and the Fences show up once more. That’s not a lot of control, but really, these settings cover just about everything most users would need. For a free application, Fences is blissfully devoid of nag screens, banners, and other annoyances. Some of its best features are invisible, like that excellent trick for hiding desktop icons. It’s one of those tools that really grows on you. It actually makes the Windows desktop useful again. I usually remove applications once I review them, but I think I’ll let Fences stick around for a while – it’s that good. Are you a Fences user yourself? Did you spring for the paid version, and was it worth it? They are now charging $9.99 for the former free version. I got a new laptop & went to install the free version of Fences. There is no free anymore. I have Windows 7 64-bit.I just (tried) downloading the free version of Fences. The 'Welcome to Stardock Fences' dialog box never showed up. I got confirmation that the program was successfully installed, but that's all I got. Fences appears in the new programs list, but when I click the application icon, nothing happens. I went to the Stardock website looking for help, but could not find anything applicable. I would really like to use this program. Do you know what's wrong or can you direct me to somewhere I can get some help? Thank you. That's interesting -- I tested Fences with the same OS for this post (Win7 x64) and it did work. Are you running some sort of an antivirus? You might want to try asking on MakeUseOf Answers: //www.makeuseof.com/answers -- good luck! Unfortunately, now every user that ever read a positive review about a tool free for personal use (including my own customers) has nagware installed on their system. An ad for Fences 2.0, download now! With no mention that it is a 30 day trial and no longer free for personal use. It's off my list too. Did you find it useful? Why not buy it? Clearly someone went to a lot of effort to create Fences. Surely $10 isn't too much to ask. If everything were free, we'd have died off long ago. I did find it useful, and I did buy it. I actually had to chase them for several weeks to be able to buy the software as apparently no one else had pointed out to them that purchases could not be completed via their website. "Clearly someone went through a lot of effort to create Fences"
Yes, so why not be transparent about the software being a 30 day trial and make the business practice as good as the software? Really like this as this has really help keep my desktop looking good. Now a bit more organized and could see my desktop. Fences 2.0 is now available - but the "free" version now costs you $10.00. While 10 bucks is not unreasonable, I think they should have told me about it rather than tricking me into uninstalling the free version and then replacing it with a 30 day trial that nags you whenever you log on. Fortunately I have the free version saved and I will be re-installing it. As a matter of principle, I do not do business with companies who try to trick me into doing things I do not want to do. Stardock: You're off my list! Unfortunately I don't know how to upload files to this facility (I am not a member here) but if you google "Download fences 1.0 free" you will still get a few links to the original version. I did post a reply with one of those links a bit earlier but makeuseof.com ate my answer - I guess they don't like you to post links. I like Fences! Discovered it pre-installed in my friend's netbook, toying with it for a while and now, two years after, it's installed in all my machines. It offers scrollbar so I can use very little screen estate for my work files, showing only two at the top. If I need more I can scroll down. Nifty! I've tried many desktop enhancements, like Sticks and others, but Fences is my absolute favorite. You don't even need the paid version if you just want to keep clutter out of your sight, but if you want something more, by all means go ahead. Support Stardock and its products. Be aware that some products (e.g DesktopPaints' Animated Wallpaper Maker) doesn't play nice with Fences. I really dont like cluttered desktops so I dont have a single shortcut on mine! Admittedly my wife is an ardent right from the beginning user of Fences but me I just dont see the point of having a great background that you cannot see because the screen is full of shortcuts. It is a make it clear and more beautiful i think..
Wow, that is absolutely crazy (and galling). I had no idea -- thank you for sharing that information. Outrageous as his personal practices are, we try to keep our reviews centred around the tools rather than the people. But again, this is something important to know, so thank you for sharing. I agree. Focus and the tools, but keep in mind the developers who work to create those tools. Good on them for their skills and imagination. Sure, its a pity about their boss, but he only gets a percentage. I like it! I am looking for a program that is similar to "Fences", but instead of a fenced area being placed on my desktop I want a single icon in my taskbar. If I click that icon (i.e labelled Photography), then I would like all of my "photography" related shortcuts to pop up above the icon. This way I won't use the start menu (not SO easy to use and I need to search through the programs I don't use) and my taskbar will be far less cluttered. Is there a program out there that works like this? Yes, there -is- something like that, and it's an application developed by one of Stardock's former employees. And for the life of me, I can't find it right now! I even reviewed it for PCWorld a while back, and the name simply eludes me... But it does definitely exist. i'm using it since long time. this is really helpful in organizing my desktop stuff. Very simple and cool tool. The new 2.0 beta version is worth dloading, the new features are great. Previous version slowed down my comp noticibiably (win 7, installed on hd). This latest has worked smoothly on win8 + ramdisk. Just installed this. I'm already loving the Hide Desktop feature! Woot! :) So glad you like it! Fences is really good. But is there an alternative available with almost same functionality? Not as far as I know. That's the thing about Stardock: They really know how to drill into Windows on a much deeper level than other companies. Not sure why, but that's what I've seen. I wanted this to previous icon layout when switching back and forth between two monitors, but, sadly, it doesn't. Ditched it. I'm sorry, I'm not sure I got what you were trying to do..? sorry, that should have been "preserve icon layout" when switching back and forth between two different monitors - i.e. switching from default monitor A to monitor B and back again. My system is hooked up by vga to my flatscreen tv, and when ever I turn the tv on, it sets itself as the default monitor. So it grabs all the icons and the taskbar, but fences won't preserve the layout. Then when I switch back, the layout is scrambled yet again. Fences just can't cope with this, and makes a bigger mess than Windows alone does. I have not found a solution for this. Not sure if you know this (I only skimmed this article and replies) but I thought you might be interested to know that rather than paying $20 for fences you can pay $10 for the BETA version of Fences 2.0. This "BETA" improves upon the functionality of Fences ten fold. I won't ramble on about the details but one thing it does offer is a function that preserves your layout on a "per resolution basis". I couldn't check if this would solve your issue with multiple monitors, but I suspect that it might. Thanks, Smithyy! I didn't even notice that's one of the new features in the Beta. This program changed my life when I installed it a while back. Highly recommended. I love this program. I have been using it for a few months now. it is great to keep my most used programs separate from all the icon clutter. It also keeps them in nice little spaces. And I love the double click on desktop hide all icons feature. I am already using it for some time now, and I absolutely adore it. It really does away with the desktop clutter and makes everything so organised and structured. I simply cannot do without it nowadays. I can see why! It's one of those tools that can really grow on you.